Cortisol-BSA conjugate and free cortisol. There is no cross-reactivity with BSA. Recombinant full length protein (Human) conjugated to BSA. Our Abpromise guarantee covers the use of ab1952 in the following tested applications. competitive binding assays Use at an assay dependent dilution. Cortisol is the most potent glucocorticoid produced by the human adrenal. It is synthesized from cholesterol and its production is stimulated by pituitary adrenocorticotropic hormone (ACTH) which is regulated by corticotropin releasing factor (CRF). ACTH and CRF secretions are inhibited by high cortisol levels in a negative feedback loop. 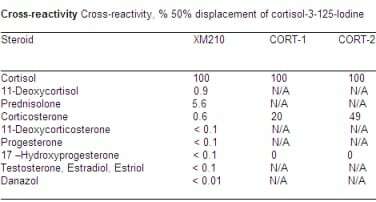 In plasma a majority of cortisol is bound with high affinity to corticosteroid binding globulin (CBG or transcotin). Cortisol acts through specific intracellular receptors and affects numerous physiologic systems including immune function, glucose counter regulation, vascular tone, and bone metabolism. Publishing research using ab1952? Please let us know so that we can cite the reference in this datasheet. Our customer is looking forcortisol antibody and I have attached reference. I searched one ofcortisol antibody from abcam website. She is going to follow this test so I also searched Cortisol 3(CMO). Please let me know if ab1949 is okay for this experiment. To be honest we do not have an antibody that we have tested with this kind of novel assay, and therefore do not know if it would work nor can we guarantee it. Although ab1949 may work, I may recommend ab1952: It is also a mouse monoclonal, is guaranteed to work in competitive binding assays (which might be more related to the intended experimental approach) and crucially detects also free cortisol. Furthermore, there is no cross-reactivity with cortisone, if this is of importance to the customer. (ab1951 is similar, but it cross-reacts with cortisone). https://www.abcam.com/index.html?datasheet=1952 (or use the following: https://www.abcam.com/index.html?datasheet=1952). https://www.abcam.com/index.html?datasheet=1951 (or use the following: https://www.abcam.com/index.html?datasheet=1951). If the customer considers testing this antibody in this application though, we would be very grateful to receive some feedback (probably once the results are published). Also, we unfortunately do not have Cortisol-3-CMO-NHS ester or something similar available in our catalogue at the moment. I am sorry that I cannot be of more assistance on this occasion, but I hope this information is nevertheless helpful to you. Please do not hesitate to contact us if you need any more advice or information. Cross-reaction of cortisol antibodies with cortisone is the following: ab1949 - 0.6 %, ab1951 - 35 % and ab1952 - 0 %.